About Us | C-KOE Metals, L.P. Originally built to handle secondary Aluminum, Charles Koetting and a partner bought the plant in 1983 and transformed it into a high end processor of unique and high-purity primary aluminum. The name C-KOE Metals became synonymous with quality. Mr. Koetting later sold his shares in the plant to his partner, only to acquire the entire operation in 2001. Charles, as the sole owner, gave the business his name and opened the doors as C-KOE Metals that year. Since then, the company has earned the respect of customers all over the world. Its commitment to continuous improvement in production, technical investments, global supply chain, and excellent customer service has made C-KOE Metals the premier supplier to many of the world’s leading aluminum users. C-KOE Metals’ mission is to be the leading source for digestible Aluminum products in both high purity and custom alloys. We are committed to adding value to our clients and providing them a competitive advantage by improving throughput, safety, and product quality. Charles Koetting is a successful entrepreneur who began his career as an industrial general contractor. His educational background in economics, along with his keen business sense, allowed him to realize the potential of a small aluminum recycling facility. Through his vision, C-KOE Metals has become a predominant source of high purity aluminum for users around the world. Charles is the driving force behind the long term business relationships, recruiting and retaining highly qualified staff, and the steady financial growth. 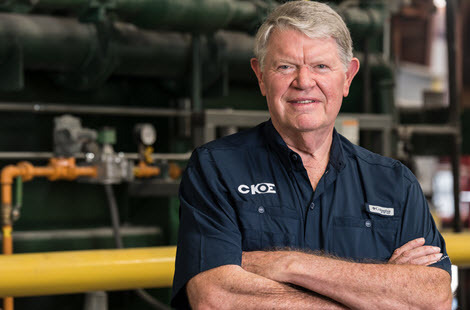 In addition to C-KOE Metals, Charles has founded more than 35 other successful enterprises in property development, construction, and manufacturing industries. Chase began his career with C-KOE Metals as a line operator. He quickly worked his way up through the positions of Production Supervisor, Quality Control Manager, Plant Manager, and has served as the Director of Operations for four years. His attention to detail and his ability to analyze and coordinate production and supply chains play a critical role in exceeding our customers’ expectations. Chase earned a Bachelor’s degree at Texas A&M Commerce and an Executive MBA from the University of Texas at Arlington. Brian is responsible for the day-to-day leadership of C-KOE Metals. He ensures C-KOE Metals is true to its commitment of bringing the best value to customers and employees. Brian’s unique business perspective comes from more than 30 years of experience acquired at Fortune 500 and start-up organizations. Prior to joining C-KOE Metals, he held executive positions in management with GMA, Lancer Systems, and General Dynamics. He also served in management and engineering capacities for Honeywell and Texas Instruments. Brian has a Bachelor of Science in Mathematics/Computer Science from the University of Texas at Arlington, and a Master of Business Administration from Nova Southeastern University. Mark brings 35 years of experience in executive sales in high-tech fields to the world of metals. Mark lead multiple efforts focused on emerging technologies in the communications sector, including dial-tone over cellular, field force automation via wireless communications, body worn computing, and long range wireless communications for electric, water, and gas utilities. These roles at Fortune 500 companies, and at start-ups, provided Mark with a deep understanding of the complex sales cycle and value-added sales strategies. Mark held key sales management positions with Tandy Corporation, GRiD Systems, Tellular, and his own utility automation company. The C-KOE Metals Team is dedicated to providing you with quality product, delivered on time, and exactly to your specifications. We strive to earn your business every day. Plant personnel average over 17 years tenure with C-KOE Metals and each new team member is hand picked by the existing staff.